For the last eight years, the American state of Pennsylvania has been riding the natural gas boom, with companies drilling and fracking thousands of wells across the state. And in a little corner of Washington County, some 20 miles outside of Pittsburgh, EQT Corporation has been busy — drilling close to a dozen new wells on one site. It didn’t take long for the residents of Finleyville who lived near the fracking operations to complain — about the noise and air quality, and what they regarded as threats to their health and quality of life. Initially, EQT, one of the largest producers of natural gas in Pennsylvania, tried to allay concerns with promises of noise studies and offers of vouchers so residents could stay in hotels to avoid the noise and fumes. But then, in what experts say was a rare tactic, the company got more aggressive: it offered all of the households along Cardox Road $50,000 in cash if they would agree to release the company from any legal liability, for current operations as well as those to be carried out in the future. It covered potential health problems and property damage, and gave the company blanket protection from any kind of claim over noise, dust, light, smoke, odors, fumes, soot, air pollution or vibrations. The agreement also defined the company’s operations as not only including drilling activity but the construction of pipelines, power lines, roads, tanks, ponds, pits, compressor stations, houses and buildings. Linda Robertson, a spokeswoman for EQT, said in a statement that the company had worked hard and conscientiously to address the concerns of the residents. She said consultants had been hired, data collected on noise and health matters, and that independent analysis had shown the company was in compliance with noise and air quality requirements. She would not comment in detail on the financial offers. Hydraulic fracturing — or fracking — has provoked a litany of health and environmental concerns since it gained popularity within the last decade. 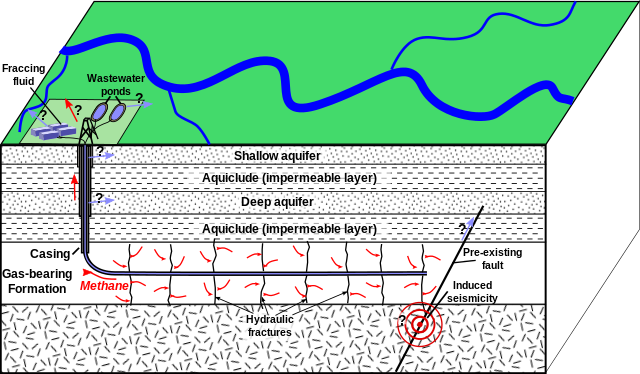 Many environmentalists and public health experts contend that the practice can pollute groundwater aquifers, drastically reduce air quality and endanger the health of residents living near wells. Over the years, the industry has vehemently denied that its work is a threat, and has often pointed to a lack of conclusive proof that gas drilling operations are to blame for any harmful health or safety issues. The industry has undertaken an array of efforts to quell these worries and preserve its business — lobbying state legislators, conducting its own scientific studies and occasionally settling quietly out of court with landowners who have threatened to sue. The liability agreements EQT has used in Finleyville — they are often known as nuisance easements — have been used in other circumstances. Residents living close to airports, for instance, are often offered such easements as compensation for having to bear with the noise, vibrations and fumes from air traffic. Property owners close to landfills and wind farms may also sign similar agreements. But experts say such easements are rare in the oil and gas industry. Clark says it is unlikely that companies will start handing out such agreements en masse, saying doing so could decrease landowners’ confidence about the safety of the company’s operations and their personal health. Earlier this year, a couple in Texas was awarded $3 million in a lawsuit against a gas drilling company. The couple alleged that the company’s operations had affected their health, decreased their property value and forced them to move away. The case was one of the first successful lawsuits alleging that air pollution from gas drilling activity caused health issues. Experts say that verdict and others like it have emboldened landowners to take their claims to court. Nuisance easements may be one way to ensure that the company can easily block landowners from claiming damages. Apart from drilling and fracking wells, EQT also builds and operates the infrastructure — pipelines and compressor stations — necessary to move natural gas to market. Its operations are headquartered in Pennsylvania but it also owns wells in Kentucky and West Virginia. In 2008, landowners in Finleyville signed a gas lease for drilling with Chesapeake Energy. The company only drilled one well, but last year it sold its leases to EQT, which has since drilled 11 additional wells. So far the company’s strategy to reduce its liabilities has worked with some landowners. Muriel Spencer, whose house is about 500 feet from the drilling, took the money. She said she did not consult with a lawyer, but had asked the company to put a five-year time frame around the release. The initial contract released the company from liabilities indefinitely. The company’s spokeswoman would not comment on how many landowners EQT approached with the proposed agreements, but said that “approximately 85% of the residents” had signed them. An initial version of the proposed standard agreement listed 30 Finleyville residents and required that they all sign the agreements in order to receive the $50,000. When the residents refused, EQT modified the agreement such that the compensation was not contingent on all landowners signing it. ProPublica found that at least four of the 30 residents have agreed to some version of the initial agreement that EQT proposed and have received $50,000 in exchange. It is unclear what changes were made to the agreement during negotiations. But some of the residents have refused to negotiate with the company. Baumgardner says his house is like an amphitheater, constantly vibrating from the drilling. At times the noise gets up to 75 decibels, equivalent to a running vacuum cleaner, he said. Earlier this year, EQT Corp. put up a sound barrier to limit the noise, but Baumgardner says it has made little difference to his quality of life. “We took the pictures down in the bedroom because they still vibrate at night,” he said. Baumgardner says he has had to leave his house at least three times so far because the gas fumes from the well site were too much to bear. A local health group has installed air quality monitors in his home and several of his neighbors. Last year when the one of the monitors began flashing red, his daughter, pregnant at the time, fled the house. She has since moved away after her doctor advised her not to live close to a drilling site. Robertson would not respond to Baumgardner’s specific assertions. She did point to several mitigation efforts she said the company had taken, including the sound wall, but also involving switching to quieter machinery and applying for permits to transport water via pipes instead of trucks. Baumgardner believes the nuisance easement he was offered is a part of the industry’s tactic to silence landowners. “Throughout the last several months, an EQT regional land manager, one of our community advisers, and our community relations manager have all been engaged in phone calls and personal meetings with residents, attended township meetings, and visited the production site on multiple occasions to identify and confirm the reported issues, if any,” Robertson’s statement said. Risky Business: The facts behind fracking. By Chris Wood, Facts and Opinions. Support our journalism: Independent, non-partisan and employee-owned, FactsandOpinions serves, and is funded by, readers. We do not carry advertising or solicit donations from foundations or causes. Our original work in Dispatches, Think and Photo-Essays is available for a $1 site day pass or at a modest subscription price. Use the SUBSCRIBE form on our free Frontlines blog to receive blog stories and notices of all new work on site.